Lately, my sister and I have been seeing a lot of lymphatic congestion in the images we take and often the client will have questions pertaining to this topic. Lymphatic congestion, is a condition in which the lymphatic system fails to drain properly, allowing toxins and cellular waste products (garbage) to accumulate in the body. It is the job of the lymph system to remove the garbage. This is a particular problem for cancer patients who’ve had lymph nodes removed or otherwise damaged in treatment, but you don’t have to have a chronic disease to experience stagnant lymph. Initial breast scan results stated client was at some risk for breast disease. 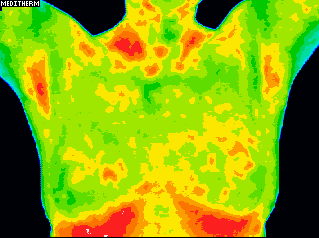 This baseline thermal scan motivated client to make significant changes in her diet, exercise, sleep, and stress management habits. 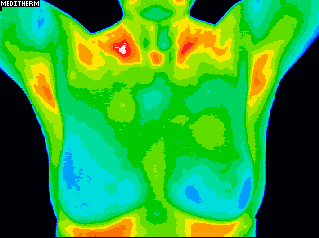 Notice the yellow/orange colors in both breast with more on left breast, as well as large amounts of red beneath breasts. These findings of lymph congestion put her at risk for disease development in the future. 3 Month Follow Up study showed significant improvement after improving her diet by eliminating sugar, wheat, dairy and drinking more water. This led to better sleep and more desire to exercise. Client was listed now at low risk for breast disease. 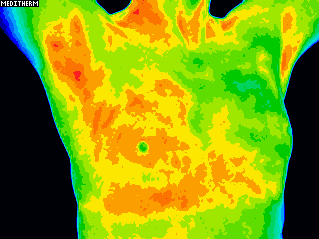 Annual thermogram shows client is maintaining her healthier lifestyle and her risk was lowered to within normal limits and at low risk for breast disease. Lymphatic congestion can lead to swollen tonsils; recurrent sore throats; chronically enlarged lymph nodes, swelling of the hands, feet, ankles, and/or breasts; slow healing; and itchy rashes. Note the intense hyperthermia in the right axilla. Lymph congestion reduces the ability of toxins and metabolic wastes to be removed from the breast tissue. This can lead to breast pains and/or breast lumps that raise a concern for further testing. Most of the lymph channels lie just under the skin, so a very light massage is all it takes to stimulate the flow of lymph. Just the weight of your hand will suffice as you stroke toward the chest, starting at the feet and working up each limb and the body. Uncomfortable or unsure about doing this yourself? A massage therapist trained in lymphatic massage will know what to do for congested lymph. If you are interested in performing lymphatic massage on yourself, here is a great YouTube video by Heather Wibbels, LMT for head congestion. And here’s one for draining lymph from the axilla. Here’s a good YouTube video of how to dry brush. Another good option is to use a rebounder to move lymph. And because systemic inflammation can create congestion and swelling that can inhibit the flow of lymph and other bodily fluids, do your best to avoid inflammation-causing foods like sugar, refined flour, soda, and processed foods. In their stead, eat foods that counter inflammation, such as most vegetables, lemons and limes, avocados, beans, sprouts, figs, some whole grains (spelt, buckwheat, millet), and some oils (sesame, olive, coconut, fish, and flax).